For some, fall means football games, cozy sweatshirts, and their favorite fall foods. However, for those heading back to school, fall means the end of summer and the beginning of homework, classes, and late nights studying. As much as you want to hang on to summer for as long as possible, eventually it has to come to an end. That being said, there are a few ways that you can enter the new school year with a bang. In today’s post, we will give you a few ideas of how you can pamper yourself in preparation for the beginning of your new school year! As much as you dread going back to school, you also look forward to seeing all of your friends and showing off your summer tan. If you really want to make an impression, you can treat yourself to eyelash extensions from Cherry Lash! We offer three base packages where you can customize the length, curl, and thickness of your new lashes. Lash extensions last between three to four weeks, meaning that you can save time on your morning routine and get the sleep you so desperately need without having to sacrifice your appearance. To learn more about our prices or to schedule an appointment with one of our lash artists, contact Cherry Lash today! Give everyone the idea that you just got back from a fabulous vacation by coming to school with a fresh mani-pedi! Not only is this a way to make sure that your nails are looking their best, but it is also a relaxing treatment that can help calm some of your nerves before the year begins. Choose a color that looks fresh and clean, such as solid pastel or a French manicure. When you go back to school, you’re sure to have your fair share of stressful assignments, so it’s vital that you have a few stress-relieving remedies in your arsenal. One way that you can prepare for your school year is to have a DIY spa night! Spas are all about pampering your mind and your body, but they are not always the most practical solution if you’re on a budget. Luckily, there are numerous recipes for DIY spa treatments online. Invite a few of your closest friends over and have a fun night making mud masks, sugar scrubs, and even your own bath bombs using your favorite essential oils! Back-to-school season is around the same time all of the stores start switching out their summer clothes for all of their fall lines. Whether you’re trying to update your entire wardrobe with the latest fall fashions or you need a few staples pieces that will make your closet feel fresh, there’s no better time to go shopping! You can make it an event by taking some of your friends and competing to find the best outfits, or you can try your hand at thrifting to find some unique pieces that nobody else will have. As much as you don’t want to think about getting up early and going to school after nights of staying up late and sleeping in, it’s important that you adjust your sleep schedule to maximize your rest. Getting enough sleep is important to help manage stress levels, eating habits, and a variety of other health-related factors. It’s a good idea to start adjusting your sleep schedule one or two weeks before your first day of school. Slowly start going to bed earlier and use an alarm to make sure you get up on time the next day. Before you know it, your body will have adjusted to the sleep schedule you will need for when you start school. One way that you can increase the amount of sleep you get each night is to decrease the amount of time it takes for you to get ready in the morning. With eyelash extensions, you won’t have to spend hours in front of your mirror perfecting your makeup. Instead, you will be able to sleep in a few extra minutes and wake up with effortlessly gorgeous lashes! Whether you want to look like you’re headed to the red carpet or you want to enhance your natural beauty, eyelash extensions are completely customizable. If you are interested in having amazing lashes day after day, contact Cherry Lash and speak to one of our lash artists about eyelash extensions today! When you go to your eyelash extension appointment, the lash artist will take the time to discuss the look that you want to achieve with your new lashes. During this time, or even prior to the appointment, you want to take the opportunity to speak with your lash artist and ask them questions about what to expect, their credentials, and any other questions that you may feel that it is important to know. At Cherry Lash, our goal is to help you feel comfortable while also providing you with amazing lashes. We offer three base lash extension packages and from there, our lash artists will work with you to customize the look to your preference. If you are interested in receiving the lashes that you have always dreamed about, contact Cherry Lash to book an appointment at one of our two convenient locations. In the meantime, continue reading below for six questions that you should ask your lash artist. Before you let your lash artist start work on your eyes, it’s important to know whether or not they have reputable qualifications. Believe it or not, but some lash studios don’t require their artists to receive any sort of formal training before they start applying lashes. Luckily, at Cherry Lash, all of our lash artists go through rigorous training to ensure that your new eyelash extensions look gorgeous! If you’ve never had eyelash extensions before, you may feel a little nervous, especially if you don’t like people being near your eyes. It’s a good idea to ask your lash artist what you can expect when they are applying your new lashes. Understanding the process will help to calm your nerves and make you feel more comfortable during the application. How should I care for my new eyelash extensions? Once you receive eyelash extensions, you can’t just forget about them until it’s time to get them refilled. There are certain ways that you need to care for them to ensure that they not only look nice, but that they also last as long as they possibly can. It’s important that you ask your lash artist what you can do to care for your lash extensions to ensure that they look their best. One of the best things about eyelash extensions is that you don’t have to avoid any of your normal activities. With lash extensions, you can go swimming, go to the gym, and even sleep without having to worry about ruining your gorgeous lashes. 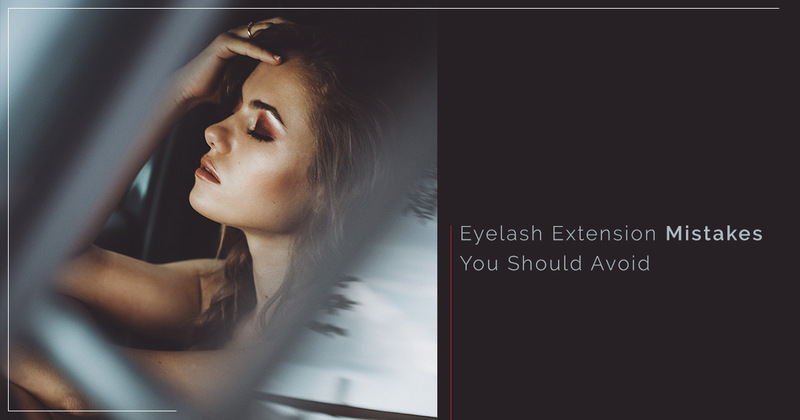 However, the first 24 to 48 hours after your lash extensions application, there are some restrictions to what you can and cannot do. Before you leave your appointment, it’s important that you have a clear understanding of what is not allowed. Why do you love lashing? The reason you want to ask your lash artist about why they love lashing is because you want an artist who is passionate about giving their clients gorgeous, thick eyelashes. Someone who sees lashing as more than a career is someone who will work hard to provide you with the amazing lashes that you deserve. Not to mention, it’s a good way to get to know your lash artist and find out what they see as the most rewarding part of their profession. At Cherry Lash, we are passionate about providing our clients with amazing lashes that they will love. If you are ready to receive beautiful eyelash extensions, then contact Cherry Lash in Henderson or Las Vegas to schedule an appointment today! There are numerous ways that you can achieve gorgeous, thick eyelashes. While some may be more tedious or time-consuming, others require very little to no time at all! If you’re desperate for luxurious lashes, you may have tried every option in the book, but eyelash extensions from Cherry Lash might be the game-changer you’re looking for. We offer three different eyelash extension packages. Once you have chosen your preferred style, our lash artists will work with you to customize the length, curl, and thickness of your new lashes. With proper care, our lash extensions will last anywhere from three to four weeks, making it easy to look effortlessly beautiful day after day. Are you ready to get the eyelashes of your dreams? Contact Cherry Lash in Henderson or Las Vegas to schedule your appointment today! In a previous post, we discussed the difference between false eyelashes and lash extensions. To give you a better idea of the benefits you will experience from Cherry Lash eyelash extensions, we will also compare extensions and lash serum. Read on to learn more, and once you’re done, be sure to browse our website to learn more about our expert lash extensions from Cherry Lash! You may have heard about lash serum, or even seen it advertised on TV, but what does it actually do? Lash serum comes in a liquid form and is designed to help your natural eyelashes grow longer and thicker. Ideally, the more you apply the serum, the more beautiful your natural lashes will become. The ingredients in the lash serum are supposed to help stimulate your body and give your natural lashes a boost without applying any makeup. Lash serum may seem like a miracle treatment — after all, spending two minutes each day to apply a serum that makes your natural eyelashes grow hardly seems like a waste of time. However, the problem with most lash serums is that they aren’t very effective. You can go to the store and buy an over-the-counter lash serum, apply it everyday, but there’s a good chance that you won’t see any improvement. That being said, there are some lash serums that have proven to be effective — the only downside is that in order to acquire these miracle serums, you need to have a doctor’s prescription. The reason behind this is because the lash serums that work typically have a regulated drug in the formula, making it impossible to buy right in the store. Even if you do manage to obtain a prescription, it will still take months for you to see the results that you desire. For some, lash serum may be the better option, but it is not always the quickest or most reliable option. Eyelash extensions can be a little on the pricier side, however, with just one session at a lash studio, you will have gorgeous lashes that will turn heads and make your eyes look bigger and brighter. Not to mention, as we referenced above, lash serums don’t always provide the results you expected, and even if they do, you may experience some side effects. With lash extensions, you pay for amazing lashes, and there’s no question that your lash artist will deliver your desired results. At Cherry Lash in Las Vegas and Henderson, we give you the option of receiving beautiful lashes in as few as two hours. If you’re tired of trying numerous methods to get the eyelashes that you desire, contact Cherry Lash and schedule your appointment today! Looking your best is always at the top of your list, and for some, that means spending hours in front of the mirror putting makeup on and ensuring that everything looks perfect. But what if you could wake up with long, thick eyelashes that made you feel your best as soon as you got out of bed? At Cherry Lash in Las Vegas and Henderson, we make it possible to love your lashes without the use of makeup. We offer three base eyelash extensions packages, and from there, our lash artists will work with you to customize the length, curl, and thickness of your new gorgeous lashes. Do you want to turn heads as soon as you walk in the room, or are you looking to enhance the beauty of your natural lashes? Whatever the case may be, Cherry Lash is here to help! View photos of our satisfied clients online, and be sure to book an appointment at one of our two convenient locations today! In the meantime, continue reading below for even more reasons why you should get lash extensions from Cherry Lash. Nothing is worse than waking up late for work or class and having to rush through your makeup routine. 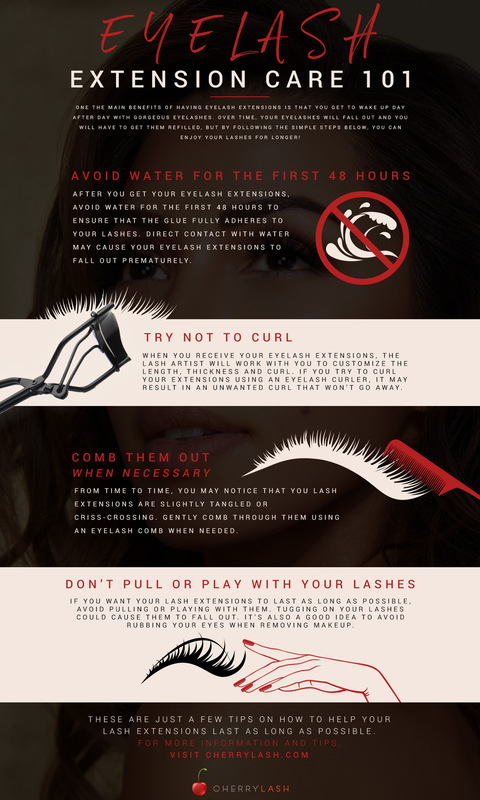 With lash extensions, your morning routine is simple and easy. Instead of spending hours in front of the mirror applying layer after layer of mascara, falsies, foundation, and contour, you can wake up with half your face already done! Not to mention, those with eyelash extensions sometimes feel like other makeup is no longer needed once they have amazing lashes. Let’s be honest — makeup is expensive, especially if you are using high-quality brands. If you are used to applying makeup every day, then there’s a good chance that you go through tubes of mascara and eyeshadow palettes pretty quickly, and once they are gone, you have to buy more. The great thing about eyelash extensions is that they last a long time, and you will only need to spend money to get them refilled. Another reason that you should consider getting eyelash extensions is that they are long-lasting. You can spend money on a pair of false lashes and wear them one or two times, but with lash extensions, you wake up each day with gorgeous lashes. After the initial appointment, your lashes will last anywhere between three and four weeks before you need to get them refilled. Until then, you can enjoy their alluring appearance! When you wear layers of mascara or fake lashes, you probably notice that your eyelashes feel heavier or even uncomfortable. However, with eyelash extensions, you may not even notice that you have them! Because the extensions are attached to your natural lashes and are made from high-quality lightweight materials, you can enjoy gorgeous lashes without the heavy, uncomfortable feeling that you are used to. 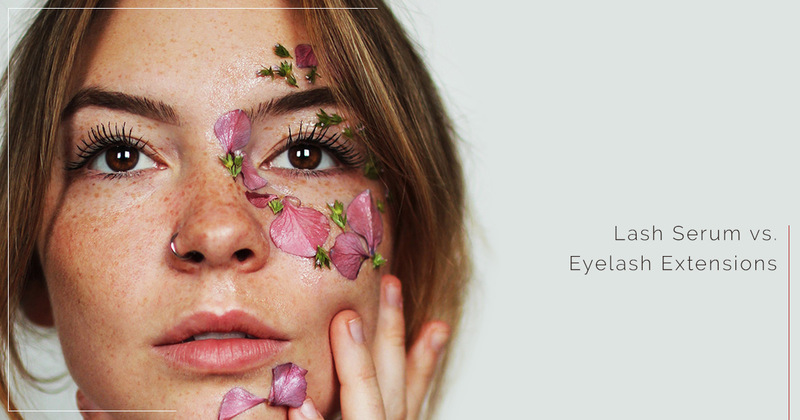 While it’s nice to not have to worry about taking off your makeup or waking up with enough time to get ready, one of the biggest benefits of lash extensions is that you will look beautiful! Long, thick eyelash extensions will naturally open up your face and make your eyes look bigger, giving you a more youthful appearance. With amazing lashes, you will always look your best. Ready to get your eyelash extensions? Contact Cherry Lash in Henderson or Las Vegas to schedule your appointment. We look forward to seeing you soon! There are many ways that you can enhance the appearance of your eyes. Many women choose the route of using eyeliner, mascara, and bold eyeshadow to give their eyes a more sultry look. There are even more women who spend hours each day in front of the mirror applying layers of foundation or false eyelashes in order to get the volume and length that they desire. But what if we told you that going to such great lengths didn’t have to be the only solution? At Cherry Lash, we offer expert eyelash extensions to help you achieve long, full eyelashes. Instead of spending every morning in front of the mirror, you can wake up each day with the gorgeous lashes that you have always wanted. We offer three base eyelash extension packages, and our expert lash artists will work with you to customize the length, curl, and thickness of your new lashes. If you are interested in learning more about what Cherry Lash can do for you, then contact us in Henderson or Las Vegas to get started today! Those who are dedicated to their false eyelashes may not see lash extensions as the solution to all of their eyelash woes. In today’s post, we will discuss a few of the differences between false eyelashes and lash extensions to give you a better idea of which one is right for you! If you decide that you are ready to set aside your falsies in exchange for lash extensions, contact Cherry Lash to schedule an appointment. Let’s be honest: cost plays a large role in most decisions, and getting eyelash extensions is no different. One of the main differences between falsies and lash extensions is the price. You can walk into any beauty store (and even some grocery stores) and find a rack full of false eyelashes for as little as $5. The cheaper price is enough to convince you that falsies are the way to go, but you also have to think about the long-term cost. Falsies are great, but they typically can only be worn once before you have to throw them away. For higher-end false lashes you may end up paying a higher price, but you will get to wear them more than once. Eyelash Extensions, on the other hand, are more costly up front. Depending on the lash salon that you go to, the price of lash extensions may vary according to the type of lashes you get and the experience level of your lash artist. That being said, what you pay for in price directly translates to the quality of materials that are being used and the expertise of your artist. You should also keep in mind that lash extensions last three to four weeks before you need to have them filled in again. Another difference between falsies and lash extensions is the way that they are applied. You can apply false lashes right at home – all you need is the lash glue. Sometimes applying your own lashes can be difficult and it may take a few tries to get it right. Not to mention, all falsies are made to be one-size-fits-all, meaning that they may not fit perfectly on your eye. Lash extensions are applied by a professional. These experts go through intense training where they learn the best techniques to give you amazing lashes. While false lashes are applied along your lash line in one long line, lash extensions are applied to your individual lashes. This process takes time and patience, but the result is worth the wait! As we mentioned earlier, the difference in price between falsies and eyelash extensions reflects the quality of materials that are used. Falsies are cheaper in cost, therefore they are manufactured with lower-quality materials. These materials often end up feeling heavier than lash extensions, and because they are placed directly on your eyelid, false lashes can often feel uncomfortable or inhibit the natural movement of your eye. Additionally, it is usually easy to tell if you are wearing falsies because the low-quality materials don’t look as natural. When you pay the higher price for lash extensions, you get high-quality materials. Typically, the extensions are made from soft lashes that are lighter in weight. The lightweight material used for lash extensions make them more comfortable — in fact, many people don’t even notice them! Additionally, the high-quality materials give your lash extensions give your lashes a more natural appearance. Learn More at Cherry Lash! These are just a few of the differences between lash extensions and false eyelashes. If you are ready to get amazing lashes that last for weeks, then Cherry Lash can help! Our lash artists will work with you to give you amazing, thick eyelashes that you will love. Check out our website to see photos of our satisfied clients, and contact Cherry Lash to schedule an appointment today!